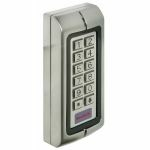 The APX-16 Compact Electronic Keypad is a two relay multi-function standalone electronic keypad. It is ideal for mounting both indoor or outdoor in harsh environments. It is kept in a strong, sturdy and vandal-proof zinc alloy electroplated casing. The electronics are completely potted so the keypad resists water and conforms to IP68. These electronic keypads provide access control by code for low risk entrance or internal doors. What's great about this product is the ability to select either 12-24v DC or 12V AC voltages.